Froggy's Fiber Followings: Road Trippin' part .....? Yeah, so there is no way I'm going to keep track of my day trips of craftiness. I would but I want to pretend I go all sorts of wonderful places all the time so I'm not. That being said, yesterday I spent some time yesterday at Knitch in Atlanta. We had been to Knitch before but it was probably over a year ago. That first trip was a bit lackluster for a spinning nut. But since then I received an email that stated they had opened the upper section of the store. While I'm not a fan of the narrow winding stairways, I decided to go back for the "expanded" fiber section. I was so pleasantly surprised when I got to the second floor. They had a nicely finished area with yarns on one side and plenty of fiber on the other. The great part was before I could get my bearings about me, MrFroggy had already pointed out the selection of glitz in the wall bins. Glitz, I wanted glitz! So we had to set a budget. Realistically there is no good budget to have when your in fiberlust but I managed to skirt under it. All told, I got 7 ozs black merino, a bag of fiber puffs from Pagewood Farm, and 6 - 1/2 ozs of glitz in red, pink, gold, cooper, green iridescent and blue iridescent. I feel all the richer for having made the purchases. 1: I meet a fellow Etsy seller, Megan. She works at Knitch (lucky lady) and has recently gotten the spinning bug. Plus she has like 20 yrs knitting experience. 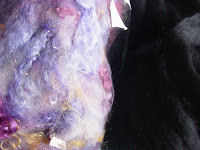 2: I saw some awesome colors of roving inside Knitch that I wanted but wouldn't fit into my budget. Fortunately, the seller had a website.... unfortunately it doesn't appear to exist in a normal Google search. What does come up is the sellers Etsy store. (Darn that Etsy, its just to darn popular.) 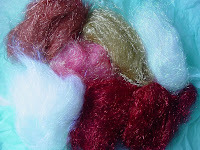 Gale's Art is an Etsy store run by a lady out of Stone Mountain, Georgia who dyes roving in Merino and BFL. She has standard colorways which is great since you can always go back for more.